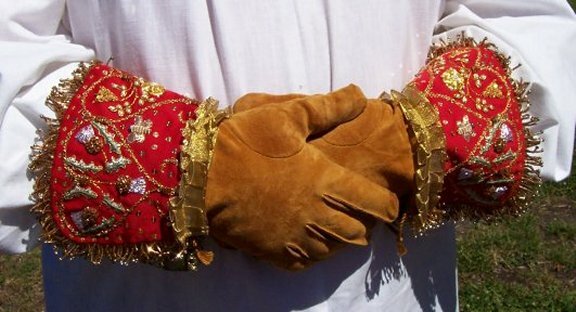 I have been making gloves for nearly all of the time I have been in the SCA. As time goes on, I will dig out some of the early examples and post them, but here are some that I have been making within the last year. 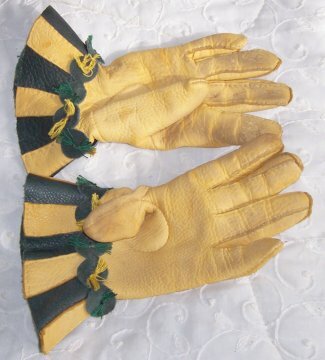 This first pair is a fancy set of embroidered Elizabethan era gloves. I made them for my husband to wear at those important state occasions. They were finished late in the summer of 2005. His personna is a Scotsman of about 1600 who works for the Polish King as a Winged Hussar. As such he would make every effort to have the latest fashions and the most expensive gear that was obtainable. Gloves of this sort were certianly fashionable in Western Europe at the time and so would have been something he might have had. I chose to use thistles to accentuate the Scottish personna, gold roses, for my standing in the SCA as a Lady of the Rose and bees, because he keeps bees. Edward's favorite color is red so that is what I chose for the color of the gauntlet on these gloves. 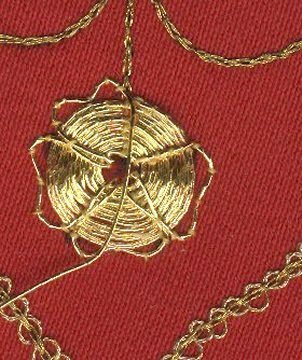 I used wool gabardine satin backed up by fine cotton twill for the embroidery fabric, and various gilt, gold metal, metallic fibers, cords, and bullion for the embroidery. 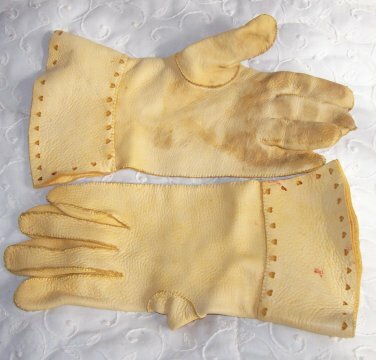 The gloves were constructed of golden colored kid, suede side out, and the whole was sewn with silk thread. I used gold metallic ribbon from the Christmas department for the ruffle at the wrist and gold bullion for the fringe around the edges. 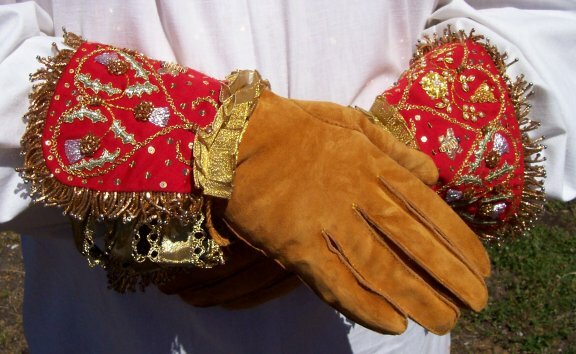 The cuffs are lined with a simple light brown satin jacard with a medallion motif. I actually made some pictures of the embroidery as I went along. 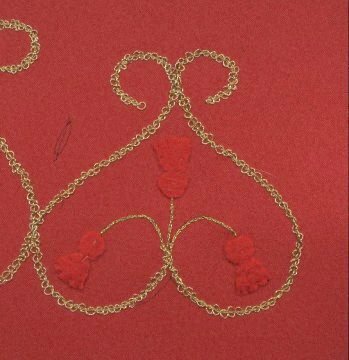 The basic outlines of the design are done in chain stitch with two interlaced threads. 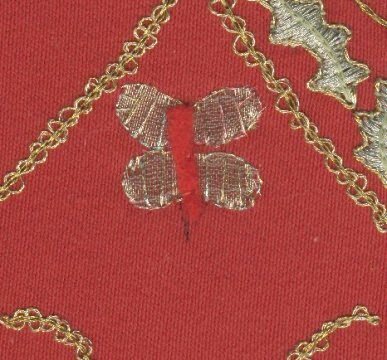 The thistles are padded with red felt, embroidered with silver jap couched with light purple silk for the flowers, and a pewter greenish silver for the leaves. 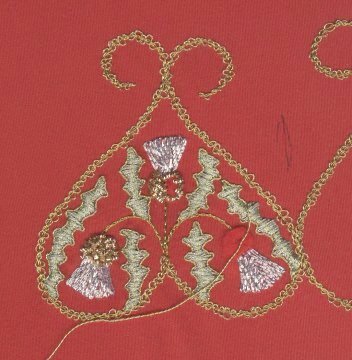 The stems of all the flowers are the chain stitch of the outlines without the interlaced threads. 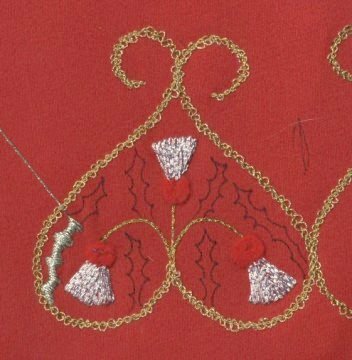 The ovary part of the thistle flower is covered with chips of bullion and the leaves are outlined with gold twist, and a chainstitch of pale green silk for veining. 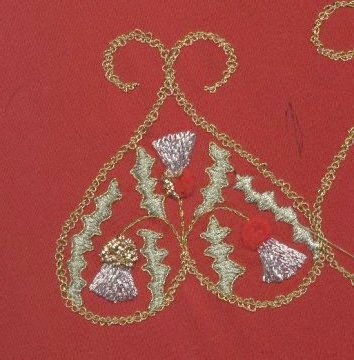 Two pictures of the stages of embroidering the roses. 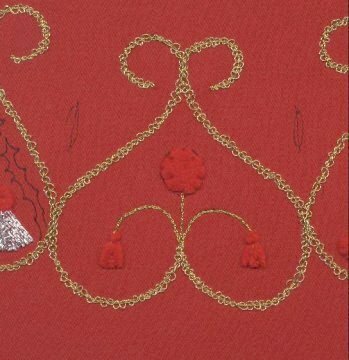 I padded the roses with the same red felt as the thistles and laid the gold jap on in layers over it to give dimension. Doing the rose leaves. 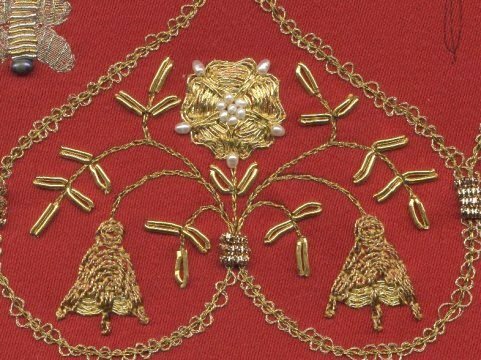 They are outlined with bullion and then an oval seed pearl was sewn into the opening. 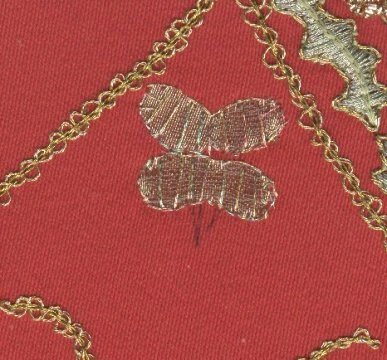 The bee wings are "christmas ribbon" of the gold organza sort. I cut out the basic wing shapes, and laid them with metallic machine sewing thread in lines over the organza and then outlined them in double running stitch in the same metallic thread. The bodies were padded with felt and alternating silver and gold bullion were laid on to make the stripes. A black pearl was sewn on for the head. Here is the embroidery on one cuff finished. I used spangles in all the unembroidered areas to add a little flash as I thought they might be a bit understated. Here are the gloves I made to try out my husband's pattern and for him to use for riding and other activities. 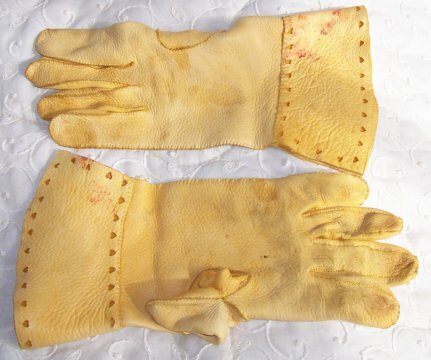 This pair is made of yellow colored deerskin, and was completed last year before I started the ones above. 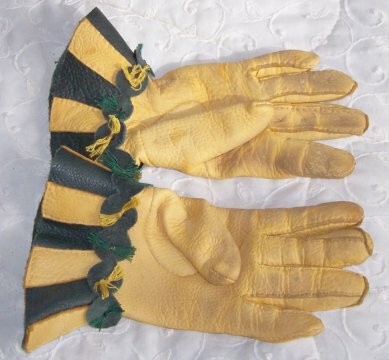 I have shown both the palm and back of each glove, one picture has the thumb turned down, so you can see the join. I stitched to the inside on the palm and to the outside on the back to give finger definition. I used an ordinary heart shaped hole punch purchased at a paper store for the heart cut-outs on the gauntlets. This pair was completed in March of 2006. They are made to be used while riding and already show some of the effects. 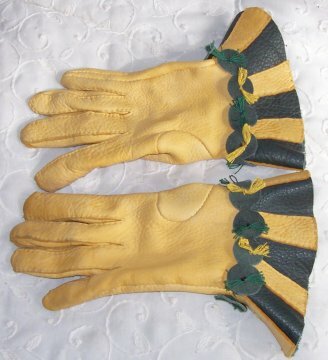 I made this pair of yellow colored deerskin with green leather gauntlets, striped with the yellow deerskin. The thumb and outside edge is sewn with the seam to the inside and all the finger seams are lapped. The cuff decoration is the green leather cut into deep scallops and sewn on with green or gold silk and knotted to create tufts.